Do you remember "Black Beauty"? How about "Charlotte's Web"? There sure are a lot of dog movies out there, but we unearthed some other pets that made a name for themselves, too. Dating back decades, animals were entertaining us with their antics far before Pixar entered the film industry. From the barnyard to the kitchen, the wilderness to the streets of Paris, dogs, cats, rodents, and farm animals have kept us entertained over the years. 1. "Lady and the Tramp"
Couples in love have tried to re-enact the spaghetti scene between these two canines. But for some reason, it's so much more romantic when it's two dogs sharing a noodle rather than two humans. A sequel exists, but it's the original that takes home the trophy. 2. "The Adventures Milo and Otis"
This Japanese film stars best friend cat and dog duo Milo and Otis. When the two are separated, they travel through the wilderness, meeting other animals along the way. The movie won awards in Japan and was a crowd favorite, eventually making it to Hollywood where 15 minutes of the original 1986 production were cut. Anna Sewell's novel became a hit with horse lovers when it made it to the big screen. The 1994 film is the fifth in the movie adaptations, all narrated by the ebony horse. It's a moving tale of love and loss and love again, the unmistakable bond between a stable boy and his horse. Few know that this 1993 film, its full title listed as "Homeward Bound: The Incredible Journey," was a remake of 1963's "The Incredible Journey." Same story, revamped name. And first, it was a book. This motley crew of two dogs, a Golden Retriever and a Boxer mix, and a cat, stereotypically named Chance, Shadow, and Sassy, encounter a slew of animals on their journey home, including bears, a mountain lion, and a porcupine. Guinea pigs of the world unite! And one evil star-nosed mole leader. Rodent superhero films are few and far between, as is their success. 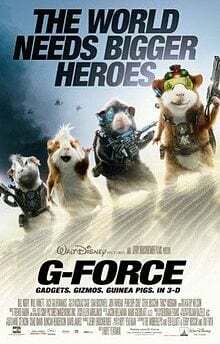 But "G-Force" made guinea pigs proud. Beethoven had a five-film series made after him, stories that included a love affair mixed into the endless pupnapping. Additional spin-offs were produced, too, but we all know the best is the first one. It's Beethoven to the rescue! This farm tale gives a bit of a history lesson, taking place in the post-Civil war era. It's a coming-of-age story of a boy and his dog. Hard decisions have to be made in this dog's tale that will break your heart in pieces. "Yeller" was the country slang pronunciation of "yellow," as the canine was a yellow Black Mouth Cur in the novel and played by a Labrador-Mastiff mix. Many don't know this series of sequels and re-makes was first a novel. The cartoon tale is as much a hit as Glenn Close's Cruella de Vil. We couldn't decide the winner, so consider it a tie. But the animals only talk in the animated films. Inspired by the Garfield comics, the famous orange cat's antics never fail to disappoint in this film. It helped that Bill Murray voiced Garfield. This tear-jerker true story was first a book. It depicts dog as man's best friend, following Marley from mischievous pup to ailing geriatric. Keep the tissue box nearby for this heartwarming story. Based on the book "The Sheep-Pig" (also called "Babe: The Gallant Pig in North America"), live and robotic animals tell the plot of a little pig just trying to fit in. Coining the iconic phrase, "That'll do pig. That'll do," the film was nominated for several Oscars and Golden Globes, snagging a handful of them. A 2006 re-make came out with live action amidst computer generation, but we still prefer the original Hanna-Barbera cartoon from 1973. Based on the children's book by E.B. White, "Charlotte's Web" has debuted as a musical on the stage as well. This farm story pulls at the heart strings whether or not you're a barnyard connoisseur. Walt Disney productions has a knack for telling animal tales. "The Aristocats" united cats, dogs, mice, and ducks in a story of unlikely friendships and forever family. Duchess is our favorite. Produced in the 1970s, it is reported to be the last film approved by Walt Disney before his death. 14. "The Secret Life of Pets"
This one is kind of a no-brainer, considering the category. With the tagline, "Ever wonder what your pets do when you're not home?" this movie is fun for all ages. But there are some jokes only adults will understand. This list of quality animal movies is far from complete. What movies would you have included? Some other awesome movies about animals include "Benji," "Air Bud," "Turner and Hooch," "Lassie Come Home," and "Free Willy." Some prefer cartoon, others live action, animatronic or CGI. Some prefer talking animals while others like stories that showcase the pet-owner bond. Whatever your idea of the perfect pet movie may be, one thing is for sure: people love pets enough to watch a two-hour movie about them. Tell us your favorite in the comments.